As businesses look to recession proof their company and reduce operating cost, needless equipment acquisitions and rentals are the first things to be removed from next quarter’s purchase order. Skid steer loaders have turn out to be a burdensome expenditure to most commercial construction companies, who are beginning to understand the cost effectiveness and true flexibility presented by self dumping forklift buckets. 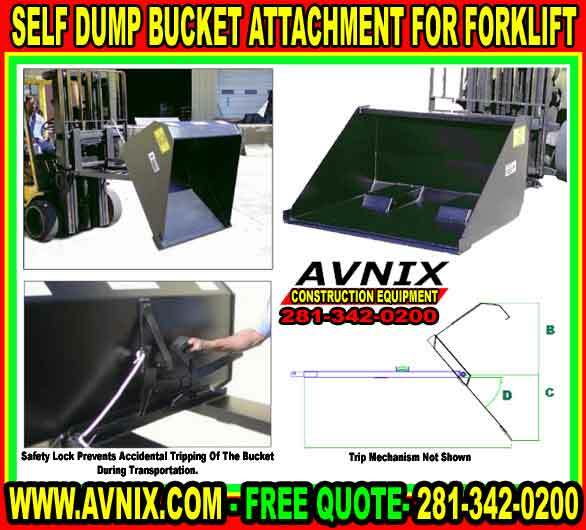 Avnix Self-Dump Buckets are wonderful for anybody who needs to load loose materials and owns a forklift but doesn’t own a loader. Setting up is fast and uncomplicated. The forklift bucket simply slips on the forks – no hydraulics – no modifications to the forklift. The ¼, ½, ¾, 1 yd 3 squared capacities are the perfect size for the masonry supply, landscape supply or anyone that wants to load small quantities of sand, top soil, mulch, landscape materials, dirt, roofing tear off, trash, garbage etc. It is also ideal for clean-up work around an equipment or supply yard. Operation is straightforward, after disengaging the safety lock the forklift bucket can be tripped with the handle at the back of the bucket or from the operator’s seat with the remote rope release. Lowering the bucket to the ground resets the bucket for the next load. Heavy duty construction and a reliable trip mechanism guarantees a long trouble-free life. A reasonably priced low cost makes this forklift bucket attachment easy to justify even for the occasional user. Danger – Do Not Use Without Installing Retaining Pins Behind The Heel Of Each Fork And Securing With Hair Pins Or Cotter Pins. Safety Chain(S) Must Also Be Used. Wrap Chain Around A Strong Part Of The Fork Carriage And Secure With Locking Grab Hook. AV1440SD ¼ yd3 45″ ID 420 lbs. AV1445SD ½ yd3 45″ ID 525 lbs. AV1472SD ¾ yd3 72″ ID 775 lbs. AV1484DS 1 yd3 84″ ID 790 lbs. AV1445SDH ½ yd3 45″ ID 600 lbs. AV1472SDH ¾ yd3 72″ ID 760 lbs. AV1484SDH 1 yd3 84″ ID 860 lbs.